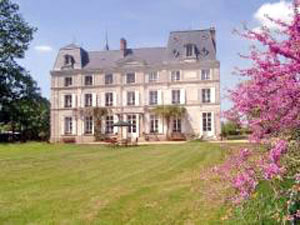 A well-being stay in B&B at the castle, Paris about 1h. 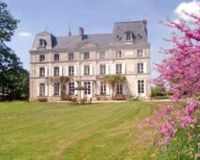 Recharge your batteries in one of the 5 bedrooms of this 19th century castle and relax in its wooded park, located between Normandy, Parche and Ile de France. 1st and 2nd Floor, the bedrooms are a suite composed of 2 or 3 rooms. Large living room with piano, library. Sauna, bikes, table tennis, fishing in the pond. Park bedroom, 2 single beds, Mare bedroom, 1 bed 1.50 m, Potager bedroom, 1 bed 1.60 m. On the 2nd floor, Suite Orchard (2 bedrooms), 1 bed 1.60 m and 2 single beds, Bergerie bedroom : 1 bed 1.60., Private bathroom/wc. Heated swimming-pool (25°C) on the spot, open between May 15th and September 30th (depending on the weather), in share with the 2 cottages on the spot (Ref 612 and 920). Common subject to the tourist tax. Business internships English, cooking, Alexander Technique, well-being. Aqua Yoga class (minimum 3 people) : 20€/hour/pers. Proposed by a certified external worker, according to its availability, on Sunday morning at 10:30, tailor-made. On the 1st floor of the Castle. 2 single beds 0.90 x 2 meters. Bathroom and wc. Room equipped with wi-fi connection. On the 1st floor. 1 double bed 1.50 x 1.90 m., bathroom and private wc. Room equipped with wi-fi connection. On the 1st floor. 1 double bed 1.60 x 2 meters, bathroom and private wc. Room equipped with wi-fi connection. On the 2nd floor. 2 bedrooms sharing a living room area. 1 double bed and 2 single beds. Bathroom, wc. Room equipped with wi-fi connection. On the 2nd floor. 1 double bed, bathroom and private toilets. Room equipped with wi - fi.